LED bulb 3W, G9, 220VAC, 220lm, 3000K, warm white, BA29-00390 G9 LED light bulb Braytron with wattage 3W, luminous flux 220lm and soft, warm white lighting 3000K. Frosted plastic shell which protects your eyes. Not dimmable. 360 Degree beam angle Direct substitute for traditional halogen bulbs with G9 base. Manufacturer's warranty 2 years. LED bulb 3W, G9, 220VAC, 220lm, 6500K, cool white, BA29-00393 G9 LED light bulb Braytron with wattage 3W, luminous flux 220lm and cool white lighting 6500K. Frosted plastic shell which protects your eyes. Not dimmable. 360 Degree beam angle Direct substitute for traditional halogen bulbs with G9 base. Manufacturer's warranty 2 years. LED bulb 4W, G9, 220VAC, 2700K, warm white, silicone G9 LED bulb with supply voltage 220 VAC . LED bulb 4W, G9, 220VAC, 4500K, natural white, silicone G9 LED lamp with 220 V supply voltage and power consumption 4 W.
LED bulb 5W, G9, 420lm, 220VAC, 3000K, warm white, BA29-00590 G9 LED bulb with supply voltage 220 VAC, 5W consumed power and light flow 420lm. Very suitable for decorative chandeliers. LED bulb 5W, G9, 420lm, 220VAC, 6500K, cool white, BA29-00593 LED lamp with 220 VAC power supply, G9 socket and 5 watts power consumption. The lamp is small in size, suitable for replacement of halogen ampoules with G9 socket. LED bulb 6W, G9, 220VAC, 4000K, natural white Mini LED bulb with G9 base, power consumption 6W and 4000K natural white ( daylight). Thanks to its small size its suitable for replacement of traditional G9 fluorescent bulbs. LED bulb 2.4W, G4, 12VDC, 2700K, warm white, 12LEDs LED lamp with supply voltage 12 VDC and base G4. It is an inovative and ecological lighting solution. List Price 4.20лв. VAT Incl. 3.99лв. VAT Incl. 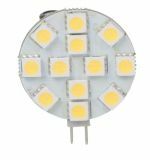 LED bulb 2.4W, G4, 12VDC, 4000K, natural white, 12LEDs The lamp is an ideal replacement for halogen lamps for spotlights, table lamps and other lamps using such lamps. It has a nominal power of 2.4 W, a supply voltage of 12 V, a socket G4 and a neutral white color (4500 K). LED bulb 3W, G4, 220VAC, 3000K, warm white, BA29-00340 G4 LED light bulb Braytron with wattage 3W, luminous flux 220lm and soft, warm white lighting 3000K. Frosted plastic shell which protects your eyes. Non- dimmable. Wide 360 Degree beam angle. Direct substitute for traditional halogen bulbs with G4 base up to 20W. Manufacturer's warranty 2 years. LED bulb 3W, G4, 240VAC, 220lm, 6500K, cool white, BA29-00343 G4 LED bulb with supply voltage 220 VAC and power consumption 3 W. Suitable for spotlights, night lamps, chandeliers and more. In this category you will find quality and economical LED lamps for Socket G4 and G9. The bulbs for these sockets are type ampoules and are an ideal substitute for perishable and energy-intensive halogenated ampoules.